[NO LONGER WORKS] VLC Media Player, if you don’t know by now, is a multi-purpose media player that eliminates the need to download codec packs in order to watch certain types of videos. Its [NO LONGER WORKS] versatility is what makes it one of the most popular media players out there. 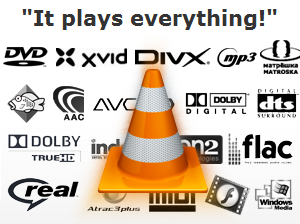 With VLC, you can play DVDs, VCDs, audio CDs, almost every type of file and even media files that are damaged. Now, with the latest update to the VLC Media Player app (App Store link), you can get all of this functionality on your iPad, iPhone and iPod Touch. In this article, I’ll explain what you can do with this application. If you’ve been following this app you’ll know that it was released for the iPad about a month ago. With the latest release, however, it is now a “universal binary which runs on the iPhone 4, 3GS and recent iPod Touches”. Being that the VLC Player is so versatile and already works across multiple operating systems, it comes as no surprise that it can work on iOS devices. But, what can you do with it? Using iTunes, you can add videos to your iOS devices that can be played with VLC Media Player 1.1.0. I should mention that the VLC app won’t play every video format, but it does play a lot of them without requiring specific encoding for your iOS device, and more extensions are being recognized with every new release. This updated app also allows you to delete files within the application, which means that you no longer have to do it through iTunes. It also features much faster decoding thanks to assembly optimizations. Do you use VLC as your primary media player? I'll post the same information to my blog, thanks for ideas and great article. I wonder why android can do it and apple can't. VLC on the PC doesn't use as many resources as QT and is more responsive ... I haven't taken the time to see how it performs on my partner's iMac. Any users out there? I had it on my iMac for about 6 months. Awesome video player. Can you please name some major formats that it can play in iPod Touch 4th Gen? Sorry Kapil, I searched for you but a list of available formats doesn't seem to exist. Chances are good though that it will play what you want to, since VLC is so versatile.